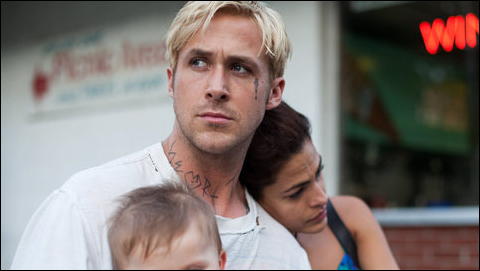 Derek Cianfrance’s (director of Blue Valentine) latest film, The Place Beyond the Pines, is a tale of two men, and how their personally vices intertwine their families and affect them for years to come. Like Blue Valentine, the story is grounded in a verisimilitude that makes it engaging, from the very first shot of the film which follows Ryan Gosling’s Luke from his trailer, through a carnival, and to his motorcycle, where he and three other bikers proceed to perform their stunts in a confined cage—all in a single shot. There are various strong shots like this throughout the film, thanks to cinematographer Sean Bobbitt. The story is broken up into three segments—each focusing on different characters as the plot progresses over the course of some sixteen years or so. As previously mentioned, the first arc of the film focuses on Luke, a biker who travels with a carnival performing stunts for a living. Returning to a town where he had a one-night stand, he reunites with his old flame (Eva Mendes) only to find that he has a one-year-old son. Determined to be there for his child like his father never was, Luke abandons the carnival, and eventually takes up bank robbing to support his kid. In this we see one of the film’s strengths—the character’s complexities. Gosling gives an underplayed performance as Luke (much akin to his role in Drive). His character doesn’t have much depth, per say, but there is a duality to him, as there is most of the characters. While he is a selfless man, willing to do what is necessary for those he cares about, and avoiding harming others in the process, there’s a reckless, violent, dark side to his personality that he struggles with (again like Drive). After about an hour, the film transitions to Bradley Cooper’s Avery, a young, ambitious cop who finds himself thrown into the spotlight and hailed as a hero for a success that Avery dramatized to attain. After this success, he finds himself caught in a web of corruption within the NYPD, and he’s conflicted on how to handle the situation. Cooper gives a serious, good performance, and his character serves as a foil to Gosling’s—whereas the latter is selfless and cares deeply for those around him, the former is more self-motivated, using those around him and a false sense of morality to get ahead. Like Luke, Avery too has a son. I mention him after the fact because the film also underplays their relationship, expositing it in a single scene. This is of importance because it is vital to the very theme of the movie. Once more, the third act (after a fifteen year time skip) focuses on Avery and Luke’s sons in high school (Jason, Luke’s son, played by Dane DeHaan; and AJ, Avery’s son, played by Emory Cohen). Oblivious to their father’s past relationship (which I’ve intentionally kept vague), the two form a venomous friendship. The both of them are affected and share their father’s sins. This is where the flaws of the film become more evident. Though the performances here are strong as well, this is definitely the weakest part of the movie. The theme (which seems to be one of a father’s roles in a boy’s life and generational sin) isn’t executed as strongly as it should be, because the film doesn’t focus enough on it. At least after Gosling’s act concludes. In that sense it feels meandering, and the length at over two hours is definitely felt. The design is strong, the performances on point, and the cinematography immaculate, but there is a lack of focus that is detrimental.